The famous Russian artist Vasily Polenov belongs to the era of Russian painting of the second half of the 19th century. He gave the world a large number of works that reflect the beautiful landscapes of immense Russia. One of the most significant pictures in the artist’s biography is the work with the simple and capacious title “Winter”; however, despite the apparent mediocrity, the work has earned worldwide recognition. When you look at the picture, a feeling of harmony and calmness, a feeling of peace. Polenov his masterpiece takes us to this picturesque place, allowing you to forget about the urgent problems and failures. It is as if the artist is trying to convey how beautiful nature can be around, especially in such a beautiful period as winter. For a long time Vasily Polenov dreamed of living in the midst of nature, so that he could have the opportunity to embody his creative ideas. 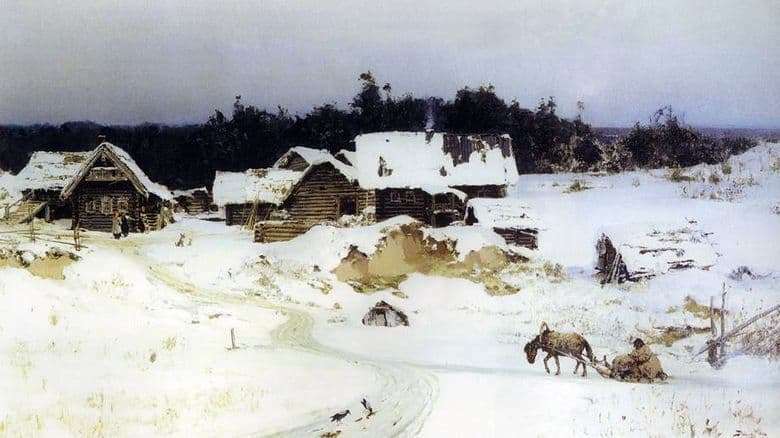 Having bought the estate Bekhovo, located near the Oka River, Polenov built a house according to his own project, without forgetting about the workshops for his friends artists. In the painting “Winter” the artist depicted the surroundings of his estate. Judging by the way the picture is written, it can be concluded that the author is satisfied with his life among the indescribable beauty of nature. In the picture we see a fragment of a forest in the distance, trees asleep, lightly sprinkled with snow, a path through the hills, which are broken by runners from the sled. Immediately the smell of snow and the sensation of the frosty freshness of the air slip through the memory. The picture “Winter” does not carry much sense, which makes you think, it helps to relax, looking at the Russian landscape of the Tula backwoods. The author will later return to work on another landscape, which again depicts the beauty of the winter period in nature, after which this new painting will become the main attraction of the art gallery in Astrakhan.